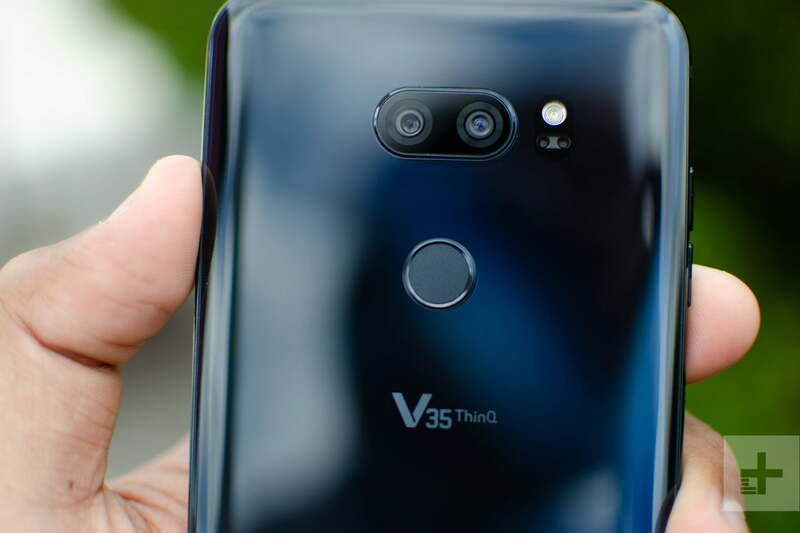 The new LG V35 ThinQ is almost the exact same as last year’s LG V30, except it boosts more contemporary specs. LG’s pricing this modest update at $900, which puts it ahead of Samsung’s latest flagship smartphones, pricing-wise. To see whether the V35 ThinQ is worth your hard-earned dollars, we put it up against the Galaxy S9 and S9 Plus. Let’s take a look. All three of these phones are top-tier 2018 flagships, and as such, they feature some of the same specs. For example, the devices boast the latest and greatest Qualcomm chip, the Snapdragon 845. While the Galaxy S9 offers 4GB of RAM and the Galaxy S9 Plus 6GB of RAM, the LG V35 ThinQ offers options for either 4GB or 6GB of RAM. Storage, however, is where the Galaxy series inches ahead. While the 64GB or 128GB of storage found on the V35 ThinQ is more than enough for most people, the Galaxy S9 and Galaxy S9 Plus both come with 256GB of storage. The Samsung Galaxy S9 Plus has the biggest battery capacity, but it also has the biggest screen. Second is the LG V35 ThinQ with its 3,300mAh battery, followed by the Galaxy S9 with a 3,000mAh battery. All three devices offer Qi wireless charging, and the V35 ThinQ boasts Quick Charge 3.0, while the Galaxy S9 devices swap it for Quick Charge 2.0. Because of the extra RAM or options for extra RAM, the Galaxy S9 Plus and LG V35 ThinQ are the winners here. All three of these phones also feature pretty modern designs. The LG V35 ThinQ offers a 6-inch display with nice, rounded corners and slim bezels. There’s still a small forehead and chin here — but they’re relatively slim and the trade-off is that there’s no notch. On the back of the phone, you’ll find a dual-sensor camera along with a fingerprint sensor around a third down from the top. The fingerprint sensor doubles as a power button. The Galaxy S9 and Galaxy S9 Plus feature almost identical designs. They also offer rounded corners and a slim forehead and chin, along with a camera and fingerprint sensor on the back. On the Galaxy S9, you’ll find a single-lens camera, while the Galaxy S9 Plus packs a dual-lens camera. Design will come down to personal choice here, as we think all three phones look gorgeous. The devices are all similar when it comes to durability. They all use Gorilla Glass 5, and they all have IP68 water resistance. Phone displays are getting better and better. Thankfully, all three of this devices have ditched LCD displays in favor of OLED ones, though they offer slightly different forms of OLED displays. Samsung has opted for Super AMOLED displays in the Galaxy S9 and Galaxy S9 Plus, while LG has used a P-OLED display for the LG V35 ThinQ. They all feature 1440-pixel resolutions too, with very similar pixel densities. Perhaps the main difference here is how big the displays are. The Galaxy S9 has a 5.8-inch display, the LG V35 ThinQ has a 6-inch display, and the Galaxy S9 Plus has a 6.2-inch display. We think Samsung’s display is stronger here, and the bigger screen on the S9 Plus can’t be beat for media consumption. The LG V35 ThinQ has a dual-lens camera with one 16-megapixel sensor with optical image stabilization and an f/1.6 aperture, along with a second 16-megapixel sensor with an f/1.9 aperture. The second lens is a wide-angle lens, which lets you capture a whole lot more in a photo. There’s also Portrait Mode, quick access to Google Lens, and A.I. Cam. A.I. Cam identifies scenes and tweaks the photo to look a little better. It hasn’t worked too well for us, though. The Galaxy S9 and Galaxy S9 Plus step things up a little. How? With a variable aperture. The aperture on the Galaxy S9 and Galaxy S9 Plus ranges from f/1.5 to f/2.4, meaning it changes based on the amount of light in the environment you’re in. That should offer you better low-light photos. The second sensor on the Galaxy S9 Plus has 12 megapixels, as well as a f/2.4 aperture. It delivers 2x optical zoom and Live Focus mode, which is similar to Apple’s Portrait Mode. Thanks to the extra sensor and variable aperture, the Samsung Galaxy S9 Plus is the winner here. All three of the phones run Android 8.0 Oreo, and they’ll all likely get the update to Android P once it becomes available to consumers — though neither LG nor Samsung are known for quick and timely updates. The software experience on the LG V35 ThinQ is relatively sleek. It’s not stock Android, and LG has tweaked various parts of the user interface to look different. There are also a few LG apps preinstalled. Samsung has done the same, adding its own personal style into its Galaxy phones, along with a lot of Samsung apps. Which user interface you like will depend on personal preference. The Samsung Galaxy S9 and Galaxy S9 Plus boast a ton of interesting features to consider. For starters, you can use your phone like a computer with the Samsung Dex Pad or Dex Station, plus you can use it with the Samsung Gear VR too. If you’re not a fan of Google Assistant, you can instead use Samsung’s Bixby. The LG V35 still offers some nice features though — the phone has what LG calls “Super Far-Field Voice Recognition,” which means it should allow for voice activation from up to 17 feet away, and it has a lot of audio features, such as a Quad DAC for the headphone jack. There’s no tie-breaking feature here. All three of these phones are flagship devices, and as such, they’re all a little pricey. The Galaxy S9 is the cheapest by quite a bit. It comes in at $720, while the Galaxy S9 Plus has a price tag of $840. The LG V35 ThinQ is the most expensive of the bunch, costing a hefty $900 to buy. This is a very close competition, but in the end the Galaxy S9 Plus inches out the competition. How? Mostly thanks to a better display and camera. If you don’t mind doing away with the dual-sensor camera, then the standard Galaxy S9 is an excellent option — and you’ll save some cash along the way.